As the proud owner of one of Steve Ricks’ famous Tennant Coats, it was only a matter of time and money before I commissioned him again. 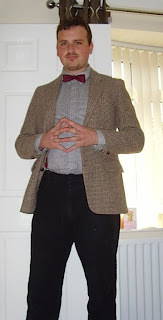 This time though, it was the Matt Smith look I was working on. A bit of background: when those pictures were published of that Southerndown beach shoot in July last year, a lot was made of the tweed and bow tie. However, for me, the two most striking elements of the costume were the boots (oh those elusive All Saints...) and the shirt; such a strange but stylish pattern, when combined with the bow tie and tweed gives a strangely modern but retro look at the same time. In fact, when I first snapped eyes on the shirt I thought ‘old-man’s shirt’ - kind of knackered, charity shop style. It wasn't until you venture up close and see that design that you realise there is more than meets the eye. My good friends on Gallifrey Base went into costume over drive and we soon worked out the various brands: All Saints boots, Topman trousers, Harris Tweed jacket and... a Paul Smith shirt. Yes PS by Paul Smith to be precise, but I was surprised. I checked out the John Anthony website and they were selling the burgundy shirt, but only had S, M and XXL. Now if I knew what I know now about the sizing, I would've snapped up the XXL there and then, however I decided that at £55, I wanted a good fit. So I noticed an alternate colour, navy blue and grabbed an XL and was disappointed to find it was very very snug. Now I don’t consider myself a particularly large chap, but I was making this thing bulge out in a not too attractive manner! So, in the wardrobe it went for a while. I’ve now finished the three main modifications I needed to do no my Paul Smith PS shirt to make it into a Matt Smith shirt: Breast Pocket, Cuffs and Buttonstand. There is, however, one more modification I am going to make, which may not be strictly screen-accurate – but it’s for my own personal comfort! The Paul Smith PS shirt is very tailored, in that it is very fitted and quite tight around the middle, being intended for a considerably slimmer frame than most normal body sizes. The shirt I bought was an XXL, which for me is ludicrous, as I normally wear a simple L. As a result, the sleeves are bordering on being too long and the collar is slightly too big for my neck, BUT the body of the shirt is tight around me. Having studied the shirt carefully, I realize there is an easy way that I can make it fit better. The back of the shirt has a dart on either side, taking in around and inch each side (see above). Notice how the shirt is quite taught around my tailor’s dummy. Today I tackled the buttonstand on the Paul Smith PS shirt, and found sometimes things are easy, and sometimes they are not! 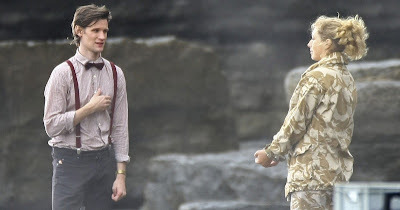 The shirt Matt Smith wears, although it is a Paul Smith PS shirt, has visible buttons when it is worn (see right). Studying the pictures, the buttonstand needs to be a full three columns of squiggles wide, lined up accurately on either edge (see right, inset). So I need to bear this in mind when I am reworking the fabric available. 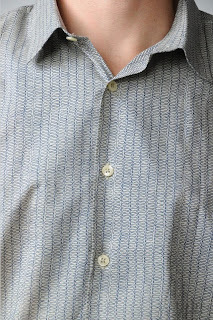 The original shirt has a concealed buttonstand, making a very clean line (see left). Sometimes these concealed stands are tacked halfway between the holes to help keep it in place, but thankfully this shirt does not have that, which should make things a little easier. This is very simply created with a single line of stitch which basically forks the shirt front into two equal width fold: the lower has the buttonholes; the upper hides them from view. The best way to show how the fabric is folded and sewn is in this diagram (see left). I have a couple of shirts to do modifications on, one for myself and a couple for friends. Mine is a XXL shirt, and both of my friends’ ones are XL in size. Before starting work I need to take a little time to look the shirts over and asses what to do and the current structure of the shirt. To my surprise I noticed something curious, and a little annoying! My XXL shirt has the buttonstand’s edge lining up with the edge of the column (just the way is needs to be) (see right), but both the XL sizes has it breaking a column in half (see far right). This makes my work a little harder, since it means I cannot use the existing buttonholes for the XL size, and my approach for each will be very different. Either-way, I need to unpick the existing placket to see what I have to work with. There is a single line of stitch which makes this, and I need to release the top and bottom so I can press it out flat (see left). Now what I do depends on how the shirt was originally made. A little while ago I had a tip-off from one of my readers. 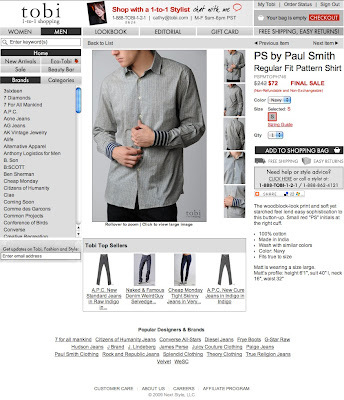 He sent me a link to a website called tobi.com selling designer clothing, including a range of Paul Smith garments. What he had spotted was the Paul Smith PS shirt as worn by Matt Smith – but not a version that had been seen so far (see below). The only colourway available was the blue, with no sign of a burgundy option. When I looked at the site there was a S and a L option available with a drop down to chose how many, though only 1 was given. I choose the L and made a purchase. When I returned to the page, the L option had gone, so I guess I grabbed the last one! This new look Paul Smith PS shirt has some design points to differentiate it from the previous version. After spending some time removing the breast pocket and the sleeve straps, I am now ready to start doing some sewing and sort out the cuffs. 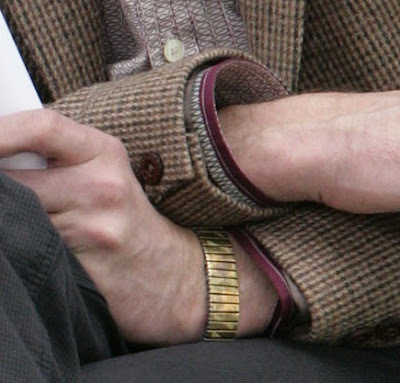 Luckily the first image of Matt in costume (see left) was of very high resolution and it’s possible to see a lot of detail around the cuff (see below). The fabric I have harvested from deconstructing the sleeve straps, although fairly substantial (see below, left), is not in a single piece long enough to run the circumference of the cuff, falling short by some four inches. I will therefore need to splice the fabric down the centre (see below, centre) and create a longer strip (see below, right).